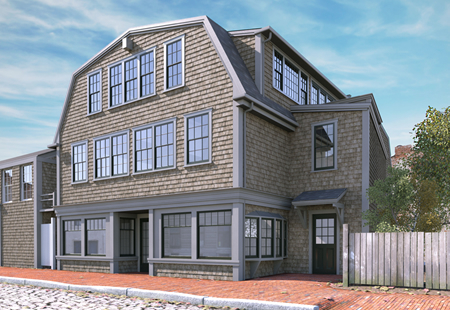 20 Straight Wharf is a 3-story, 7,000 square foot restaurant and apartment building located on downtown Nantucket’s waterfront. The building features frontage directly along the bustling section Straight Wharf by lower Main Street, with incredible harbor views from the upper floors. Previously occupied by the iconic Captain Tobey’s Chowder House, the property is currently undergoing renovations to include an upgraded exterior with a new restaurant entrance in the front of the building, and high end apartment rentals on the second and third floors with water views and their own street-level residential entrance. The building is centrally located in the heart of Nantucket’s downtown district and is surrounded by the island’s restaurants, boutiques, and hotels. 20 Straight Wharf is considered by many to be one of the premier locations in Nantucket, and is convenient to both the island’s Hy-Line and Steamship Authority ferries and full-service marinas. Nantucket is one of the country’s most popular summer destinations and tourist attractions, and is located approximately 26 miles south of Cape Cod with access through its ferries, airport, and marinas.